The TEAS Reading test will evaluate your skills in paragraph comprehension as well as informational source comprehension. For the paragraph comprehension questions you will be asked to read a passage of text and then answers questions about the text. On the informational source questions you will be asked to review a graphic or statement, and then answer questions about it. Start your ATI TEAS 6 test prep right now by taking our free TEAS Reading practice test. Questions 1–2 are based on the following passage. Are you looking for a way to give back to your community, but don’t know where to start? One of the best ways you can invest in the future of your community is by helping to better educate our youngsters. Schools are under-funded, and even talented teachers are beset with the growing pressure of helping students without enough resources. With our group-funding program, you can go online and look through thousands of teacher programs that are looking for funding. These programs were designed by teachers who know what they need to help their students succeed. Very rarely do you get the chance to donate money and know exactly where your money is going. Donate today and help change the lives of a classroom of students in your community. Which of the following is a unique benefit of this group-funding program? Answer choice (C) is correct because the author directly states that “very rarely” does a person donate directly to someone in need (rather than to a charity). Answer choices (A) and (B) are benefits of any donation someone makes, and answer choice (D) isn’t reflected in the passage. Based on the context, which of the following is the meaning of the word “beset” in the passage? Answer choice (A) is correct because “beset” is used in the passage to describe how teachers feel when they can’t do their job properly. Answer choice (B) and (C) reflect these difficulties, but each of them imply a fight, whereas “beset” is about being too restricted to excel. Answer choice (D) can’t be right because if teachers were giving up, they wouldn’t need donations. Questions 3–4 are based on the following passage. I think it’s time for us to open a new location. We’ve been talking about doing it forever and I’m afraid that if we don’t do it now, we’ll never do it. I know it’s a risky move, but the only way our business is going to grow is if we take calculated risks. Business has never been better, and our focus group data shows that people in Springdale would love to have one of our stores in their mall. If we do this right, we can be twice as profitable as we are now in three years. Let me know what you think. PS: We can even announce the expansion after that Channel 4 puff piece airs to take advantage of the attention we’ll be getting! Based on the tone of the memo above, which of the following best describes Sonja and Gabriela’s relationship? Sonja and Gabriela work in the Human Resources Department together. Answer choice (D) is correct because the tone of the article is one of mutual respect. The writer uses collective pronouns such as “we” and “us” to suggest that the two people are equally invested in this decision. While answer choice (C) may also account for this familiarity, it wouldn’t make sense for two people from HR to decide to open a new location. Which of the following best captures the author’s purpose? Revitalize a struggling business by opening a second location. Improve a successful business by opening a second location. Position herself as a more powerful leader than Gabriela. Convince a colleague that they should do more research on where to open a second location. Answer choice (B) is correct because the author’s first sentence mentions opening a new location. She also writes that, “business has never been better,” which refutes answer choice (A), and also points off that they have already done the research necessary to prepare for this expansion, which refutes answer choice (D). Questions 5–7 are based on the following passage. Many teachers across the country are noticing the importance of film in the modern classroom. No longer is putting a movie on meant as an invitation for students to check out while the teacher does work at their desk. Films are a versatile medium, and can function as textbooks, pieces of literature, or pieces of art that can bring a new dimension to a student’s learning. The teachers leading this charge know that teaching a film effectively means preparing lessons with the same amount of time and effort as any other days. A teacher could simply shut the lights and throw on the first 20 minutes of Steven Spielberg’s “Saving Private Ryan” because the class is studying World War II. Or, the teacher could spend a class period analyzing the scene with the class, looking at how Spielberg builds anxiety and tension, how he creates the chaos of the beach, and how he gets the audience to care for characters they haven’t even met yet. Which of the following is the author’s overall conclusion concerning teachers using film in the classroom? Young teachers who use film in the classroom are doing their students a disservice. More teachers should show the opening scene of “Saving Private Ryan” in their classes. Films can be great learning tools if they are used effectively in the classroom. Films are a good tool for students who have reading difficulties. The correct answer is answer choice (C). The overall point of the passage is to prove how films can be a great learning tool. While answer choice (D) might be a correct statement, it doesn’t reflect what the writer wrote in the passage. Answer choice (B) reflects a misunderstanding of the purpose of discussing “Saving Private Ryan” in the passage and answer choice (A) is directly refuted by the passage. Which of the following sentences would be a supporting detail to explain how “Saving Private Ryan” could be used in the classroom? Learning to analyze a film in this way can not only help students get more out of their viewing, but it can also help them work on their critical thinking skills. Just putting “Saving Private Ryan” on the screen and then getting work done in the back of the room is not a helpful way to use a film in class. Too many teachers are stuck in their ways, though, and unwilling to adapt. “Jaws” would also be a good movie that a teacher could use in the classroom. Based on the context, which of the following is the best meaning of the word versatile used in the passage? In context, the writer refers to films as “versatile,” and then finishes the sentence with a list of all the ways films can help students. Therefore, “versatile” means something that can be used in many different ways. None of the other answer choices make sense in context. Questions 8–9 are based on the following pie chart. Which department had the most students for their summer courses in 2017? After adding up all departments you will see that history has the highest percentage. Next highest is science, at 22%. Which of the following conclusions is supported by the data in the graph above? Mathematically, choice (A) and (B) are incorrect. Answer choice (D) might be true, but the chart does not distinguish between important and unimportant classes, so this choice is a matter of unsubstantiated opinion. Biology has a higher percentage of enrollees than the other science classes, so answer choice (C) is correct. Questions 10–14 are based on the following passage. Mahatma Ghandi was an inspirational leader who made a lot of sacrifices for the people of India. In 1921, Gandhi took charge of the Indian National Congress, a group of thirteen men in the Indian government who fought discrimination and unfair taxation against farmers and urban laborers. Using the nonviolent tactic of civil disobedience, Gandhi and his followers bravely resisted British control over Indian life, choosing not to follow unfair, discriminatory laws and policies. The British were not happy to see Ghandi and his followers rebelling in this way. The British responded to this resistance by strengthening their military presence in India, often at the cost of human lives. While Ghandi was fighting to gain more freedom for the people of India, the British government was, often violently, suppressing it. For his effort, Gandhi was eventually imprisoned in 1942 for his “radical” beliefs, but he refused to recognize violence as a means of fighting the British. He gained international attention for his hunger strikes, refusing to eat until the British changed their unjust policies. Which of the following best describes the author’s portrayal of Gandhi? The words “unfair,” “discriminatory,” and “unjust” reveal that the author has a negative view of the British policies over India during Gandhi’s time, and therefore a positive view of Gandhi. This narrows the choices to (A) or (B). While the author does use biased diction to describe the British policies, his descriptions of Ghandi are factual and informative and therefore objective. Which of the following is a logical conclusion based on the passage? Ghandi was brave, but ultimately unsuccessful in his pursuits. The British changed their unjust policies. In Ghandi’s mind, civil disobedience means only using violence as a last resort. Ghandi’s followers were fiercely loyal and stood by their leader at all times. The correct answer is answer choice (B). The final sentence states that Ghandi didn’t end his hunger strike until the British changed their policies, which implies that they eventually changed their policies. There is no evidence to suggest that Ghandi was unsuccessful (A), or that his followers were “fiercely loyal” (D). Answer choice (C) might be tempting, but note in the passage that Ghandi refused to resort to violence under any circumstances, so he wouldn’t even use it as a last resort. Which of the following words from the passage BEST displays the author’s opinion towards the British rulers that Ghandi was rebelling against? The correct answer is answer choice (D). The writer uses the word “unfair” in her description of the British government’s control over India. Answer choice (C) might be tempting, but the writer doesn’t suggest that taxation itself is bad, rather that the British are unfairly taxing the people of India. Answer choices (A) and (B) are not used in reference to the British, so they are incorrect. What is the author’s primary argument in the passage? Gandhi used non-violent protests to successfully alert the world to unfair practices of the British against his country of India. Gandhi went too far in his protests and was subsequently imprisoned by the British authorities in India. Gandhi started a congress in India to pass legislation to fix unfair labor policies in the country. Gandhi was probably the most effective historical figure to use the tactic of a hunger strike. The correct answer is answer choice (A) because it succinctly gives a good summary of the main ideas if the passage. Answer choice (B) expresses an opinion that is not offered in the selection. Answer choice (C) only states one point provided in the selection rather than focusing on the main ideas. While answer choice (D) may be true, it does not reflect an opinion expressed in the passage. The British government’s increased military presence in India led to the loss of life. Ghandi bravely employed nonviolent civil disobedience to rebel against Britain’s unfair discrimination against the Indian people. Ghandi was well-known internationally for his hunger strikes. Ghandi took charge of the Indian National Congress in 1921. The correct answer is answer choice (B). This is the only answer choice that expresses an opinion. Answer choices (A), (C), and (D) are all expressed in the passage, but they are factual in nature. Questions 15–16 are based on the following passage. When a scientist wants to do an experiment, they need to follow what is called the scientific method. The scientific method structure for experimentation that ensures valid data. In using the scientific method, experimenters must first state the purpose. What is the problem or the question that they are exploring? In order to make sure the experiment is worth the time, they should then do research to see if anyone has already collected valid data on the subject. Experimenters can then use that data, and their prior knowledge, to propose a hypothesis, or a prediction of what is going to happen. Once the parameters and expectations are clearly stated, experimenters simply have to carry out the experiment, collect the data, and draw conclusions. If experimenters don’t follow this method, they risk corrupting their data and drawing inaccurate conclusions. Which of the following best describes the structure of this text? Answer choice (B) is correct because the passage describes the sequence an experimenter would follow to use the scientific method. Which of the following statements best describes the author’s point of view? Even if we don’t know it, we all use the scientific method in our everyday lives. Too many experimenters blindly use the scientific method without exploring other options. If an experiment doesn’t verify the hypothesis of the experimenter, it is a failure. Using the scientific method is the best way to make sure your experimental data is accurate and valid. Answer choice (D) is correct because the author mentions the importance of the scientific method several times in the short passage. The author never mentions answer choice (A) and directly refutes answer choice (B). There is no evidence from the passage that answer choice (C) is correct either. Where is your destination compared to your original location? The correct answer is (D). The easiest way to solve this question is to visualize the moves: 1 block left, three blocks up, two blocks right. The total distance from west to east is 1, and the total distance from south to north is 3. An individual reading a book about the first emperor of China wants to find the first reference in the book to the Terracotta Army. Where should he or she look? The correct answer is (D). An index contains the page numbers in which a specific word or phrase is mentioned and discussed. Questions 19–20 are based on the following passage. Congratulations on being named Employee of the Year for 2018. We appreciate all of your hard work and how dedicated you have been to our company. When the committee convened to discuss the potential award recipients, you became a clear frontrunner because of your long hours and the 11% growth in global sales that your team achieved in a slowing economy. As you know, this award comes with a new parking spot, a $5,000 bonus, and a plaque displayed near our office entrance. Please see Su Yun at your earliest convenience for your official photo. Which of the following statements from the passage is a fact? Karla’s team achieved 11% growth in global sales. Mrs. Bukhari appreciates all of Karla’s hard work. Karla is dedicated to her employer, Systematic Alliance Reserve, Inc.
Karla’s new parking spot will be better than her old one. Answer choice (A) is correct because “11% growth” is quantitative data, and therefore fact. Answer choices (B) and (C) are not factual, they are subjective and qualitative. Answer choice (D) could be a fact if we knew it was true, but the memo gives no indication of the quality of the parking spot. One would expect that it is better because the parking spot is a prize, but that would be an inference, not a fact. Business is a team sport, and it’s important to recognize the efforts of everyone involved in a project. The best way to keep people from leaving a company is to give them big cash bonuses. People who work hard and succeed despite the obstacles in front of them deserve to be rewarded. In a tough economic climate, businesses can only survive if the lay people off. Answer choice (C) is correct because the purpose of the memo is to congratulate and employee for winning “Employee of the Year” as a result of their hard work. Answer choice (A) might be tempting, but the company isn’t rewarding Karla’s whole team, only Karla. If they valued group contributions, she wouldn’t be receiving all the credit for her team’s work. Questions 21–23 are based on the following passage. A spacesuit consists of several pieces. The Hard Upper Torso covers the astronaut's chest. The arm assembly covers the arms and connects to the gloves. The helmet and Extravehicular Visor Assembly are designed to protect the astronaut's head while still allowing him or her to see as much as possible. The Lower Torso Assembly covers the astronaut's legs and feet. The flexible parts of the suit are made from several layers of material. The layers perform different functions, from keeping oxygen within the spacesuit to protecting from space dust. Underneath the spacesuit, astronauts wear a Liquid Cooling and Ventilation Garment. Tubes are woven into this tight-fitting piece of clothing that covers the entire body except for the head, hands and feet. Water flows through these tubes to keep the astronaut cool during spacewalks. On the back of the spacesuit is a backpack called the Primary Life Support Subsystem. This backpack contains the oxygen that astronauts breathe during spacewalks. It also removes carbon dioxide that astronauts exhale. The backpack also provides electricity for the suit. A fan moves the oxygen through the spacesuit and life support systems, and a water tank holds the cooling water that flows through the Liquid Cooling and Ventilation Garment. Which paragraph explains how spacesuits prevent overheating during a spacewalk? The correct answer is (C). The third paragraph mentions how the Liquid Cooling and Ventilation Garment keeps astronauts cool during the spacewalk with water that flows through tubes along the astronaut’s body. Which part of an astronaut’s suit helps astronauts breathe properly? Which of these sentences represents a summary sentence for the passage? A spacesuit is much more than a set of clothes astronauts wear on spacewalks. NASA is also looking at what will be needed on spacesuits for trips to Mars. The correct answer is (A). Since the passage discusses all the different, important components of a spacesuit, the correct choice will likely mention the word “spacesuit” and impress upon the reader its importance. Answer (A) does this without bringing up new information, as the other choices do. A summary should stick to what information is already presented in the passage. Based on the information above, which of the following is a possible arrangement listed from oldest to youngest? Use the process of elimination to determine the correct answer. Which three income groups pay a combined payroll tax rate of more than 29%? Read and follow the directions below. Start with a full deck of cards. Remove all four jacks and four kings. Add back in the red jacks. Remove half the remaining cards at random. Which of the following tells the number of cards now in the deck? The correct answer is (C). A deck has 52 cards. Removing the jacks and kings reduces the deck to 44. There are 2 red jacks, so adding them back in makes the total 46. Removing the four eights reduces the number to 42. Divide that number by two and we get the final total of 21. Questions 27–28 are based on the following table. Trevor has very fair skin and is planning to take a trip from his home in London to Miami. At minimum, by how much should be increase the SPF in his sunscreen? The correct answer is (A). Someone at home in the UK with very fair skin should wear SPF 15–30. Someone with very fair skin in Florida needs an SPF of 50+. That means Trevor should increase his SPF by 20–35, a minimum of 20. Which of the following is true based on the table? SPF 30 is not enough for a fair-skinned person to wear in Europe. A dark-skinned person could wear less sunblock in the UK than in Africa. An olive-skinned person should wear more sunblock in the Mediterranean than in the Caribbean. Children should wear less sunblock than fair skinned people while at home in the UK. The correct answer is (B). According to the passage, a dark-skinned person should wear SPF 15 in the UK, but SPF 15–30 in Africa. 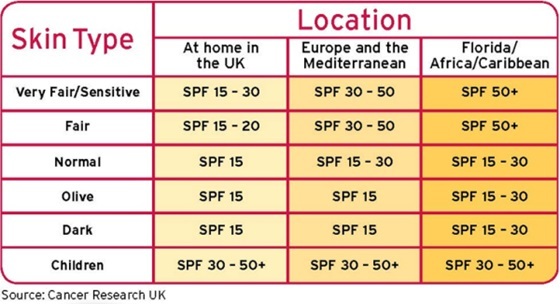 This implies that they could wear a lower SPF in the UK than Africa, if they wore SPF 30 in Africa and SPF 15 in the UK they would still be within these recommended guidelines. Questions 29–30 are based on the following passage. A blood glucose test, or fasting PG test, is given after a patient has gone without food for at least eight hours. It's widely considered to be a reliable test, and it appears the results aren't affected by patient age or physical activity. Many doctors prefer this method of testing because it's easy, fast and inexpensive. The correct answer is (D). The passage says that the test is “reliable” because “the results aren’t affected” by other factors. Most likely, doctors view the test as accurate. The correct answer is (C). The first sentence describes the test as “blood glucose” or “PG”—it’s likely PG stands for plasma glucose, as plasma is a near-synonym for blood. Likely the test measures the amount of glucose in the blood. Questions 31–35 are based on the following passage. Compared to most of our country’s other Founding Fathers, Thomas Paine is essentially unknown. In fact, there are many Americans who have never even heard of him. Paine was born in 1737, the son of a corsetier—a tailor specializing in corsets and other undergarments—and grew up in rural Thetford, England. As a young man, Paine worked as a corsetier, sailor, and minister, but found his true calling when he moved to the British colonies in America. Thomas Paine was an extremely talented writer; Thomas Jefferson and John Adams drew heavily on his work when drafting the Declaration of Independence. Later in life, Paine wrote other, highly controversial works. He was even exiled from England and imprisoned in France for his writings. In 1796, Paine did his part to inspire what would become Social Security. He suggested a system of social insurance for the young and the elderly in his last great work, Agrarian Justice. Which of the following is a logical conclusion based on the first paragraph of the passage? Paine was one of the Founding Fathers. Paine was a talented writer who sparked the American Revolution. The Declaration of Independence could not have been written without Paine’s contribution. Paine’s wide range of job experiences likely helped him develop his political opinions. The correct answer is (A). The first sentence compares Paine to "our country's other Founding Fathers." From this statement we can conclude that he was one of the Founding Fathers. None of the other choices are directly supported by the first paragraph. What inference can be drawn from the second paragraph of the passage regarding Thomas Paine’s Common Sense? It was the only real contribution Thomas Paine made to the American Revolution. It inspired King George to vow revenge on Thomas Paine. It relied heavily upon his background as a minister for inspiration. It acted as a catalyst for the American Revolution. The correct answer is (D). The paragraph discusses the book’s forceful argument for American independence, then goes on to discuss how many copies it sold, implying that it inspired people to want to revolt. None of the other answers are reflected in the passage. Without Thomas Paine, the American Revolution never would have happened. Thomas Paine should be remembered for the contributions he made to the American Revolution. Thomas Paine’s later work was even more influential than his early work. Thomas Paine wrote anonymously, and therefore doesn’t deserve recognition for what he has accomplished. The correct answer is (B). The writer begins the passage by remarking that most Americans today don’t even know who Thomas Paine is, and then goes on to discuss all of the reasons he should be remembered. Answer choices (C) and (D) are not supported by the passage, and while the writer does posit that Thomas Paine made important contributions to the American Revolution, he doesn’t go so far as to imply that it never would have happened without Paine. The reader can infer that this passage was taken from which of the following? The correct answer is (B). Because the passage is informational and factual, it is likely not from a political treatise (too opinionated) or a historical novel (fictional). Between a history textbook and a tourist guidebook, it is more likely that the passage is from the former since the passage contains no information about specific places that would be of interest to a tourist besides the brief mention of Thetford. Which of the following is an inference that readers can make from the final sentences of the third paragraph? Thomas Paine wrote Common Sense and inspired hundreds of thousands of people. Thomas Paine became a criminal late in life. Thomas Paine’s writing continues to have an influence on America. Thomas Paine wrote his greatest works when he was imprisoned later in life. The correct answer is (C). The final two sentences of the passage discuss Paine’s influence on modern social security, showing his continued influence. While Paine is imprisoned later in life, the passage implies that this has nothing to do with criminal acts (B), and there’s no evidence from the passage to suggest that he wrote his best work while in prison (D). (A) is a fact that is stated in the second paragraph, so it does not need to be inferred and it is also not a part of the paragraph in question. Questions 36–37 are based on the following passage. At only five years old, Wolfgang Amadeus Mozart had already written five musical compositions. What are you waiting for? If you want to accomplish something in your life, the best day to start working towards it is yesterday. The universe only rewards people who are willing to take risks. Mozart was 5 when he was already on his way to being a legend; what’s holding you back? Which of the following best supports the argument in this paragraph? According to Stanford researchers, following your passions will lead you to be less successful in life. Wolfgang Amadeus Mozart began going deaf when he was around 30, and was completely deaf by age 40. Pablo Picasso’s first words were “piz, piz” a shortened form of the Spanish word for pencil, and by age seven he was receiving formal training in figure drawing and oil painting. Children who show incredible talent early in life often end up not fulfilling their potential. Answer choice (C) is correct because it provides another example, like the author’s example of Mozart, of someone who knew what they wanted to do from an early age. Answer choice (B) might be tempting because it is about Mozart, but it doesn’t provide any information that directly supports the author’s argument in the passage. Which of the following additional sentences would work best at the end of this passage if it were an advertisement for a school or college? The world needs more doctors, so you should start trying to be a doctor today. No matter what you want in life, you need schooling. Mozart didn’t wait; you shouldn’t either. Enroll in our school today and find out who you want to be. Answer choice (D) is correct because it is an accurate call to action for an advertisement that a school is running. Answer choice (C) might be tempting, but it would work fine with the passage as it is now and offers nothing new that relates to an advertisement for a school or college. Answer choices (A) and (B) would be less effective than the correct answer because they are too specific and not specific enough, respectively. Questions 38–40 are based on the following chart. What type of material has been the most recycled? The correct answer is (A). In each decade, the green bar representing paper is the tallest. In what year did the recycling of plastic get close to 10%? The correct answer is (D). The yellow bar representing plastic is well below 10% until the final year on the chart, 2010. Which of the following conclusions can be made with certainty about the chart? Recycling of some products increased in 1960 from the previous years. 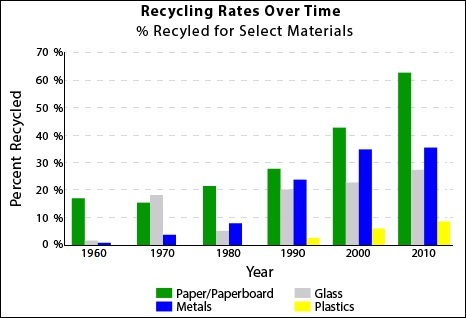 There is no data indicated on the chart to show if 1960 held an increase or decrease in recycling for any of the materials. There was no recycling before 1960. The general population was not environmentally aware of recycling in the years prior to 1960. Since we do not have data about what happened before 1960, we cannot tell if recycling increased or decreased in 1960. This eliminates choices (A), (C), and (D) and makes answer choice (B) the correct answer. 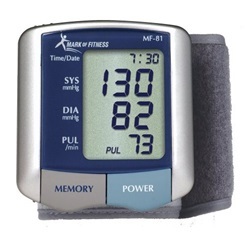 Based on the blood pressure monitor above, what is this patient’s pulse rate? The correct answer is (A). Your heart rate, or pulse, is the number of times your heart beats per minute. It’s the number next to the PUL abbreviation on the heart rate monitor. A customer eating one of these prepared biscuits should probably limit which type of intake for the rest of the day? The correct answer is (A). The prepared biscuit has 30% of the recommended daily percentage of saturated fat. Since this is the highest percentage for daily recommended values of the percentages for prepared biscuits, this is the ingredient that should be limited for the rest of the day. Question 43 is based on the following passage. For some, the poverty and deprivations of youth must be credited with the grandest achievements of adulthood. The poet Robert Burns and his brother were expected to do the work of men at the age of thirteen. He had some schooling before then, and must have improved during this time, for he could read and spell well, and had some knowledge of English grammar. Which of the following would provide the best support for the claim made in the first line of the passage? A young artist from a wealthy family receives the best education that money can buy, but still does not succeed as a painter. A young writer comes from an impoverished, rural background, and receives a scholarship to university, but fails to make something of herself. A child prodigy becomes a world-famous violinist before reaching puberty, despite growing up in a working-class household. A playwright is inspired to write beautiful plays about the destitution and difficulties of his childhood, and becomes widely acclaimed as the greatest writer of his generation. The correct answer is (D). This answer describes someone growing up in "destitution" (which is another word for poverty) and later becoming "the greatest writer of his generation." What is the maximum weight this scale will measure? The correct answer is (D). The label for 300 lbs. is just above the 0 at the bottom of the dial. Question 45 is based on the following passage. Since rejoining UNESCO, one of our top priorities has been promoting literacy, with a particular focus on girls and women. To that end, quality providers of informal education have played and will continue to play a key role in decreasing the global adult illiteracy rate. We know that informal education can be more flexible and help reach adults who have long ago dropped out of the formal school system or who were systematically denied access to school. As the largest government donor to UNICEF, the United States is supporting efforts to support safe schools, and quality education for each and every girl and boy. Which of the following is not something with which the author of the above statements would likely agree? The correct answer is (C). Look for a statement that is directly contradicted by the passage. The author says that “informal education” plays a “key role.” There is nothing to indicate the author thinks it is not as good as formal education. Only (C) is not logical based on what we know about the author. Questions 46–50 are based on the following passages. Jonathan Swift’s dark view of humanity is expressed in his novel Gulliver’s Travels (1726). Swift believed that society, which is meant to protect people from inequality and injustice, actually encourages the worst evils, promotes immorality, and allows injustices to occur. In Gulliver’s Travels, Swift asks whether “civilization” is only an elaborate cover for the lowest forms of human behavior. Swift raises this question through satire, a literary form which he brings to perfection in Gulliver’s Travels. Following in the great tradition of classical satirists, Swift uses his novel to point out the underlying ridiculousness of the society around him. In one section of Gulliver’s Travels, for example, Gulliver describes his native England to the king of a land of giants. Gulliver talks enthusiastically to the giant king about the class system, laws, constitution, military glory, and history of his homeland. After carefully listening to Gulliver’s speech, however, the king proceeds to point out the many shortcomings of Gulliver’s native land. Gulliver is unable to come up with adequate responses to the criticism. He can only stand there in embarrassed silence as the king eventually concludes that the institutions of the human world should be condemned. The correct answer is (A). Usually, quotation marks are used to convey sarcasm, or to question the typically accepted meaning of a word or phrase. Since Swift questioned society, it’s likely the author uses the quotes to convey Swift’s skepticism. The correct answer is (C). The primary purpose of the passage is to explore how Swift expressed his “dark view” of humanity in his novel Gulliver’s Travels. Answers (A) and (B) are too broad and extreme to be correct, while (D) is too specific. The correct answer is (B). The example of the king is used to point out one way Swift used Gulliver’s Travels to highlight his own view of the ridiculousness of society. The king also believes England’s civilization has “many shortcomings.” Answer (D) is tempting, but we do not know anything about the opinions of the author of the passage itself. Which of the following is an opinion expressed in the passage? In Gulliver’s Travels, Gulliver discusses government and culture with the king of the land of giants. Gulliver’s Travels presents a dark view of humanity. Gulliver’s Travels is Swift’s most perfect satire. In Gulliver’s Travels, Gulliver is unable to respond to the criticisms of the king in the land of giants. The correct answer is (C). The writer suggests that Swift’s satire is perfect, which is clearly an opinion. While some may say that answer choice (B) also expresses an opinion, it is a fairly objective statement that is supported by the passage. Answer choices (A) and (D) are just plot points from the novel, and are therefore not based on opinion.